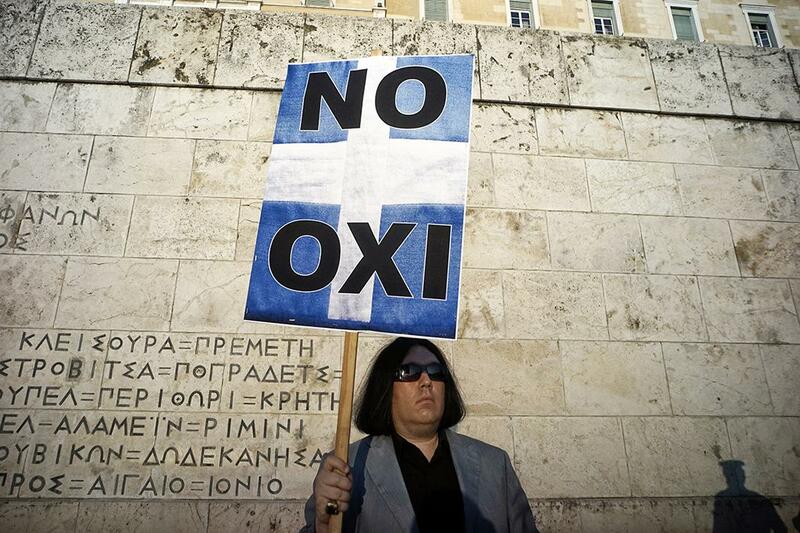 A demonstrator holds a sign opposing the bailout in Athens, Greece, on June 29, 2015. 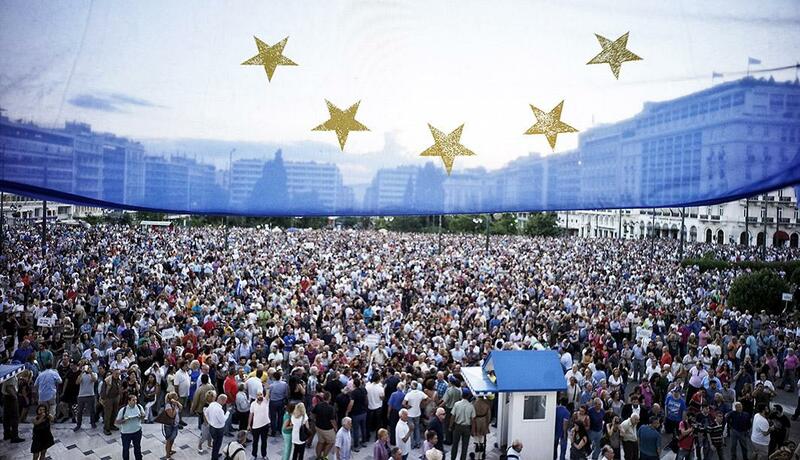 Pro-European Union protesters rally in front of the parliament on June 18, 2015, in Athens. 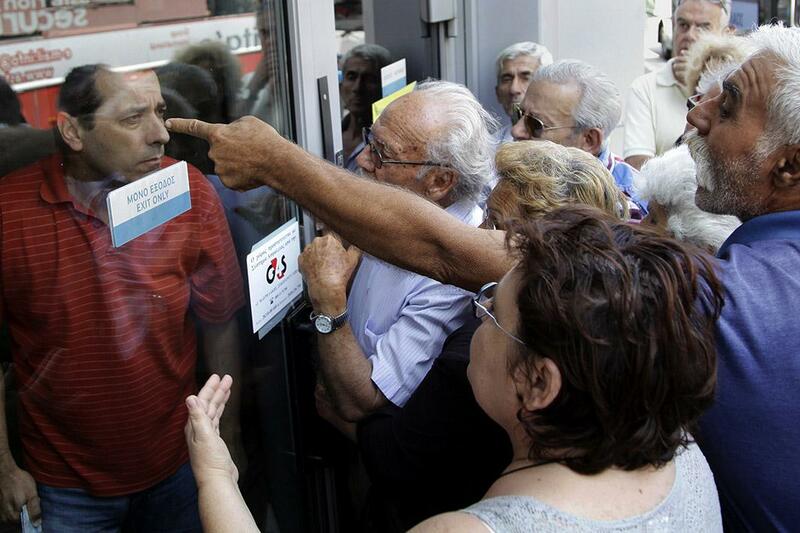 Pensioners waiting outside a closed National Bank branch, hoping to make withdrawals, argue with a bank employee, left, in Iraklio on the island of Crete, Greece, on June 29, 2015. 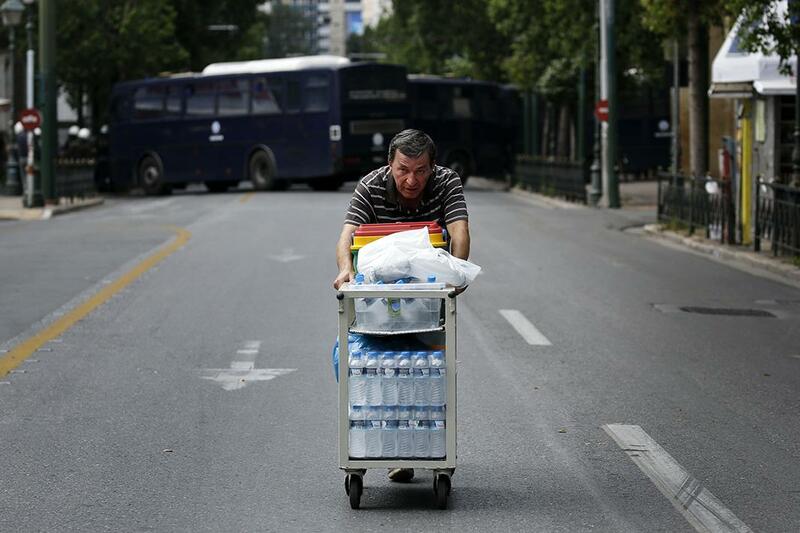 A man pushes a trolley with bottles of drinking water for sale on a deserted street during demonstrations in Athens on June 30, 2015. 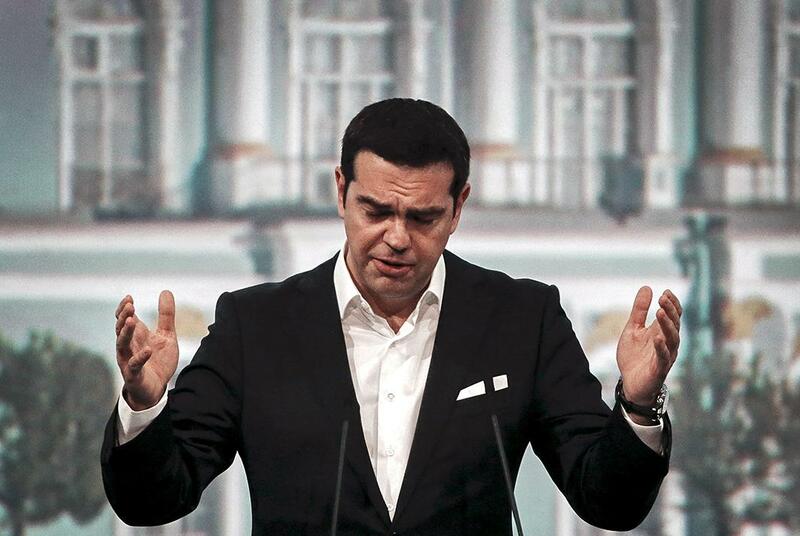 Greek Prime Minister Alexis Tsipras speaks during a session of the St. Petersburg International Economic Forum in St. Petersburg, Russia, on June 19, 2015. 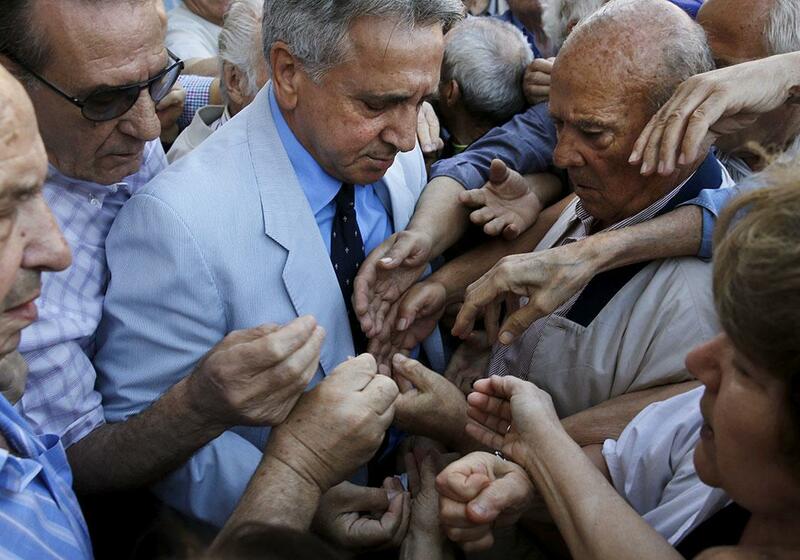 A National Bank branch manager, center, gives pensioners priority tickets as they wait to receive part of their pensions in Athens on July 1, 2015. 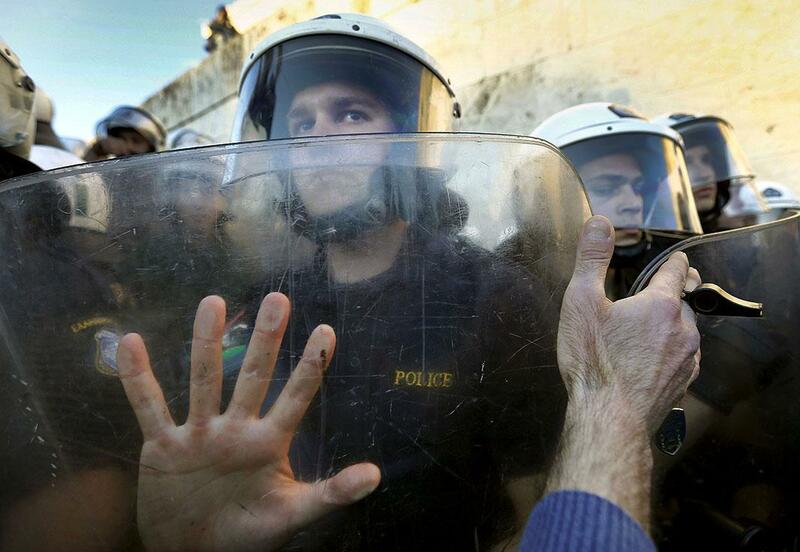 A protester places his hand against the shields of riot policemen guarding the parliament, during a rally calling on the government to clinch a deal with its international creditors and secure Greece’s future in the eurozone, in Athens on June 22, 2015. 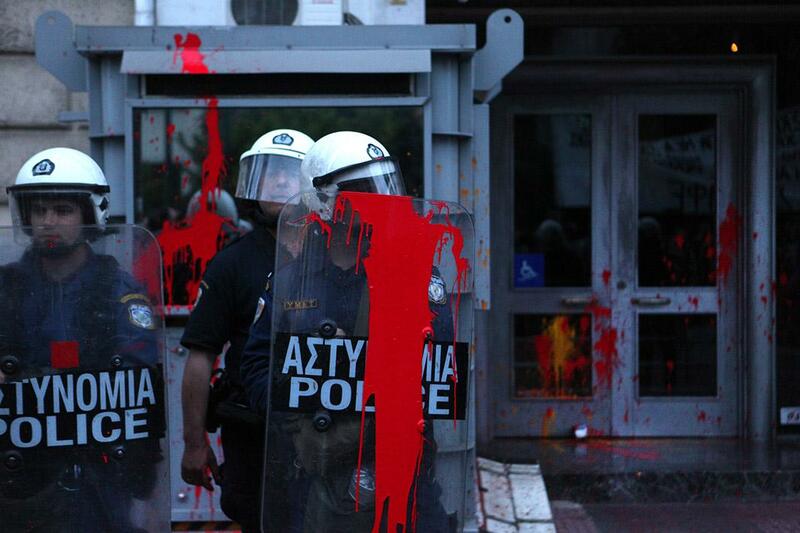 Riot police, hit by red paint balls, stand guard as protesters, demanding the cancelation of Greece’s EU debts, stage an anti-European Union march in Athens on May 11, 2015. 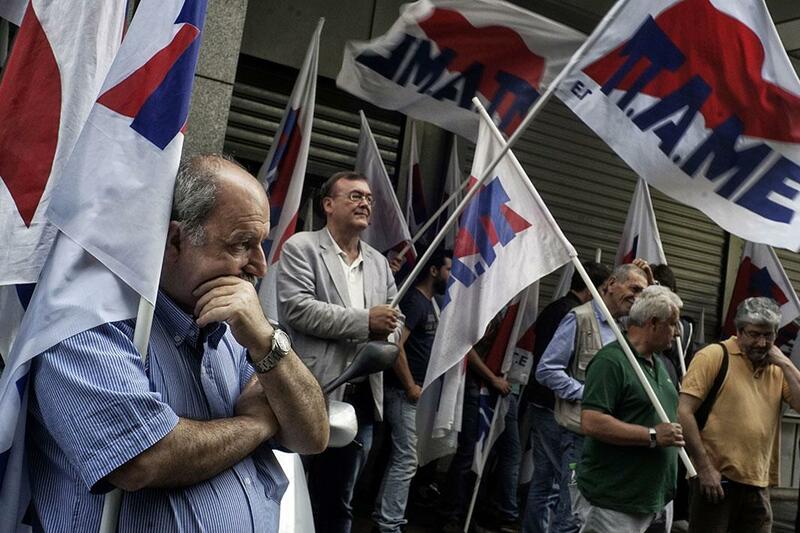 Protesters from the communist-affiliated PAME workers union block the entrance to the finance ministry on June 11, 2015, in Athens. 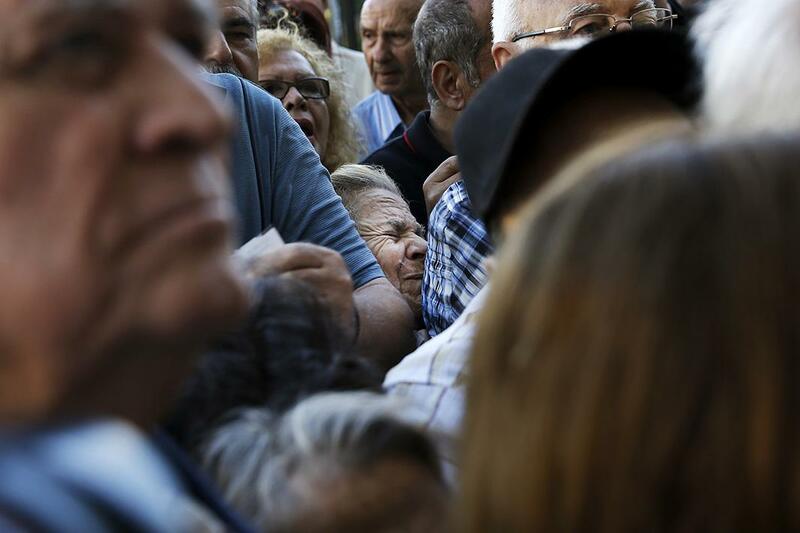 A pensioner, center, is squeezed as she waits outside a National Bank branch to receive part of her pension in Athens on July 1, 2015. The owner of a lottery and sports betting shop watches Tsipras on television in Athens on July 1, 2015. 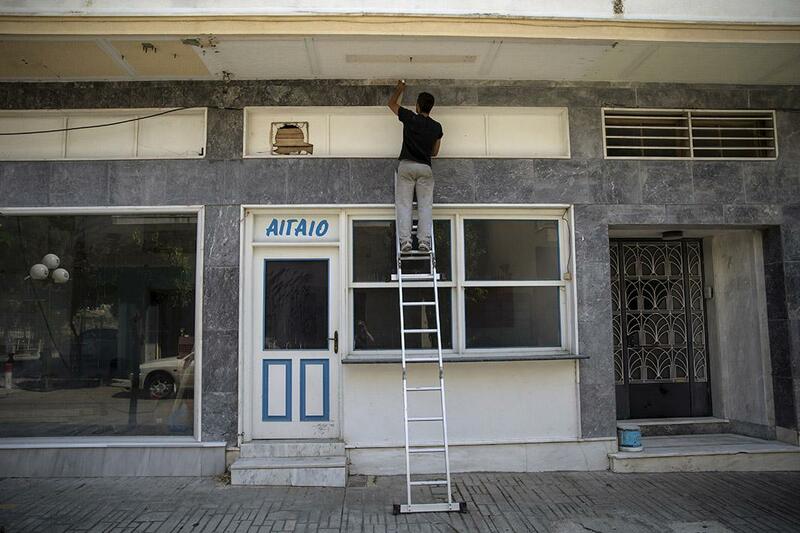 A man works on a ladder at a closed shop in the town of Elefsina, near Athens, on June 30, 2015. 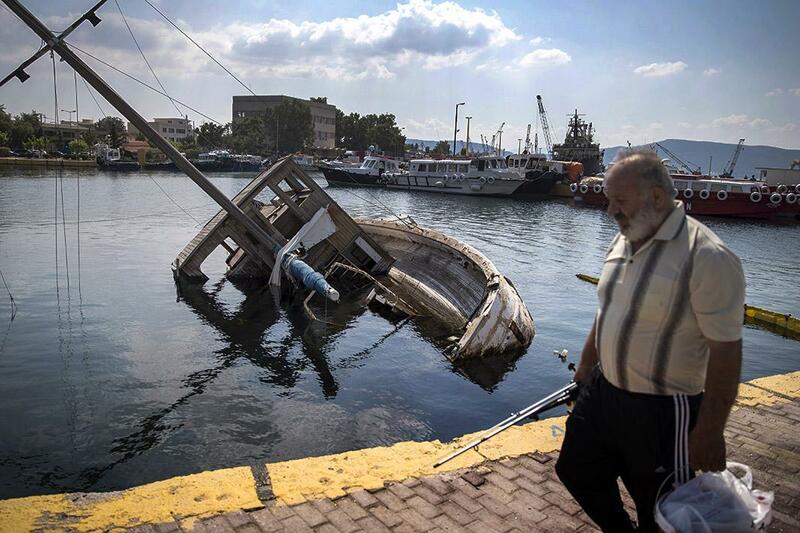 A man walks past a capsized boat at a marina in the town of Elefsina, near Athens, on June 30, 2015. 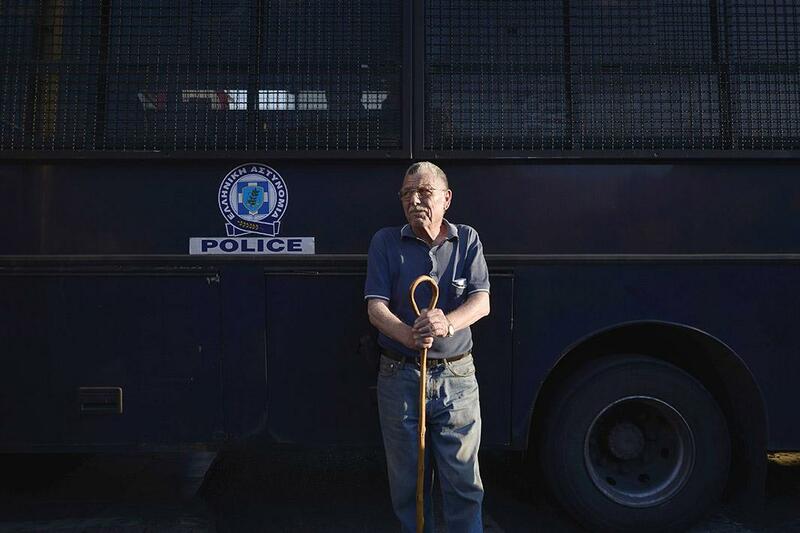 A pensioner stands in front of a police vehicle blocking the way to the Greek prime minister’s office, as pensioners rally against austerity measures on June 23, 2015, in Athens.